Russian Interior Ministry opens case over pitch invasion during FIFA World Cup final | Russian Legal Information Agency (RAPSI). 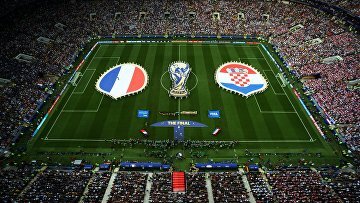 MOSCOW, July 16 (RAPSI) – Administrative cases have been launched against four activists behind a pitch invasion during FIFA World Cup 2018 final match between Croatia and France, the press-service of the Interior Ministry’s Moscow department has stated. Alleged perpetrators are charged with unlawful behavior of spectators during official sport events and face fines of up to 10,000 rubles ($160), 60 hours of community service and prohibition from visiting sport events for three years. They are also charged with illegally wearing state uniforms and face fines of up to 1,500 rubles ($24).